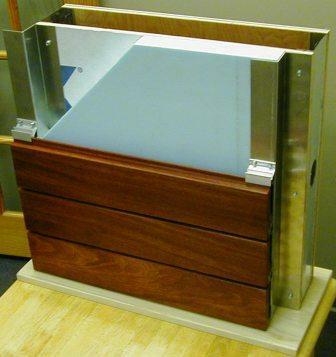 This page includes architectural rain screen information, specifications and design options for the Climate-Shield® Rain Screen System. 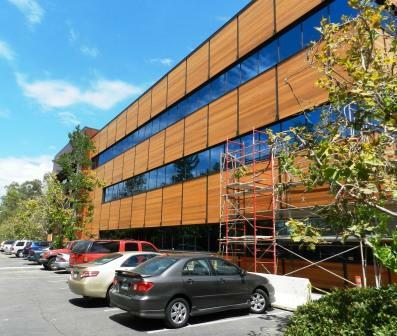 Climate-Shield's rain screen technology allows architects, builders and owners the flexibility to design and install rain screen wood siding horizontally, vertically or diagonally without having to worry about how to layer furring strips or creating complicated designs for horizontal furring strips. When installed with Mataverde® Rain Screen Hardwood Siding you have a handsome and healthy rain screen system which will add sustainable design and beauty to your home or structure. At the top course of siding in the Climate-Shield Rain Screen System, where the cladding will typically intersect a soffit, the siding should be ripped to the proper height to meet your design criteria. 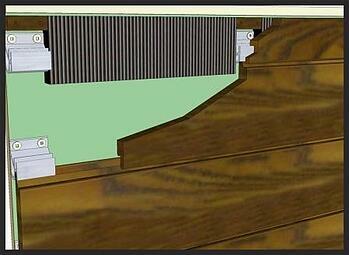 The drawings below depict a typical interface between the top course of wood cladding and the soffit. For the most efficient design and installation, solid blocking is normally installed between the siding vent material for strength and efficient design functionality. 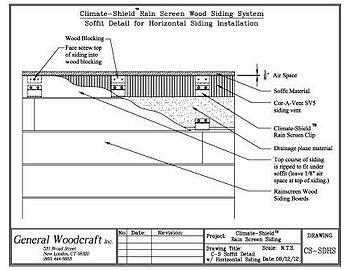 At the top end of wood siding boards in a vertical rainscreen cladding installation of the Climate-Shield System, where the cladding will typically intersect a soffit, the siding should be cut 1/8" short to allow adequate ventilation at the top of the wall section. 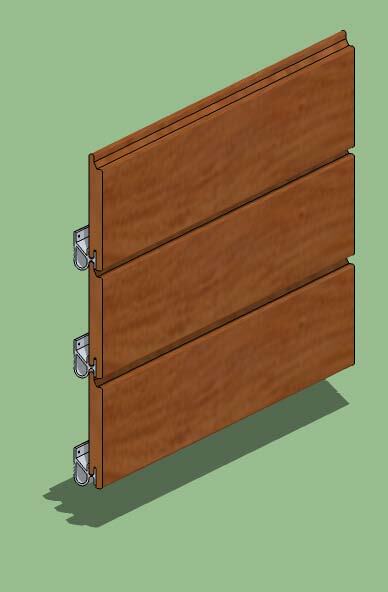 For the most efficient design and installation, the rain screen clips are installed at the top of the vertical wood siding and siding vent material is installed below the rain screen clips. 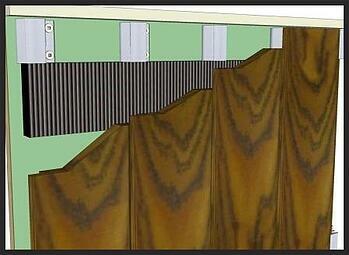 See illustration for vertical cladding under soffit detail. 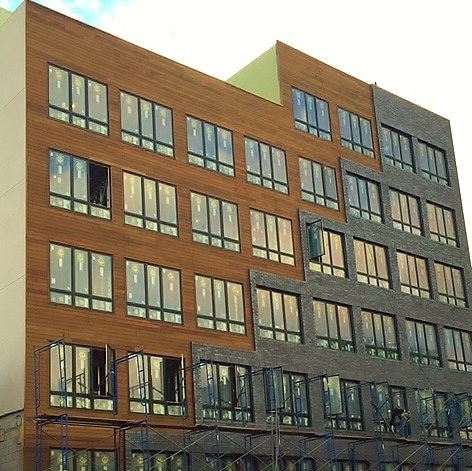 The Climate-Shield™ Rain Screen Aluminum Corner System can be designed and engineered to meet the unique needs of your project design. The Climate-Shield Aluminum Corner System can be powder coat finished to meet your design scheme objectives. Create a more traditional outside corner for your Climate-Shield Rain Screen Wood Siding System with custom wood outside corners to match your wood siding. 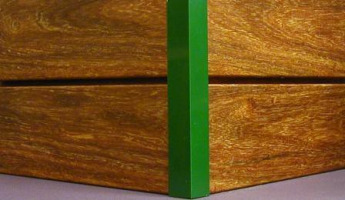 Designed in a wide variety of profiles, thicknesses and patterns, these attractive wood outside corners which can be built on-site or designed and built for you in our architectural woodshops. 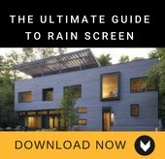 To complete the sleek lines of your rain screen design, don't forget to consider how you will treat your inside corners. 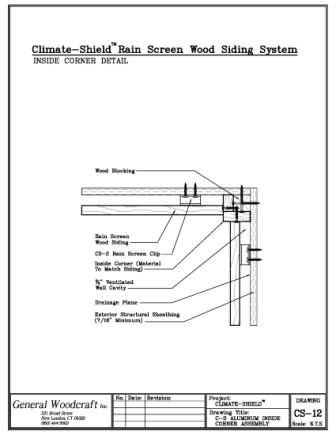 A typical inside corner is built on site using wood blocking attached to the outside of the building envelope. Then you can attach the same material you have selected for your wood siding material to fasten to the blocking for a clean matching appearance. You are free to select blocking and the finish material in sizes that best achieve your design goals. 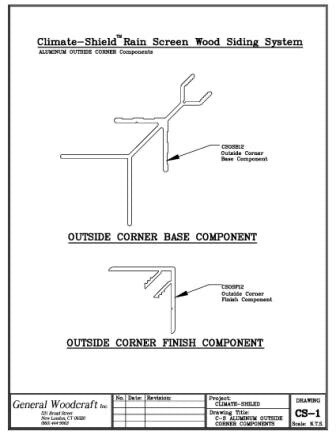 In the adjacent architectural drawing of the inside corner detail, the designer chose to let the inside corner sit about 1/2" proud of the siding. 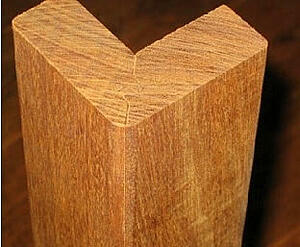 Depending on how pronounced you would like this architectural detail to appear, you may select larger or smaller sizes for your blocking and finished material on your inside corner. 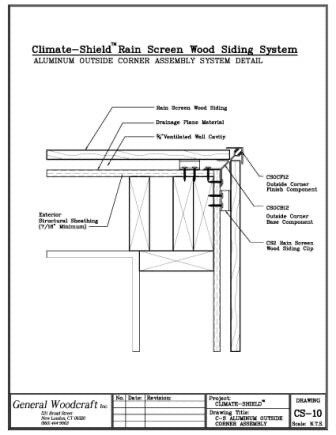 The following architectural drawing shows a Climate-Shield Rain Screen 1x6 installation detail and fastening layout with rain screen starter rail on a building envelope using structural sheathing. 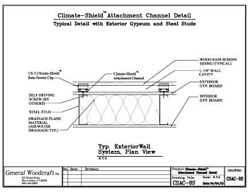 The following architectural drawing shows the Climate-Shield Rain Screen 1x4 installation detail and fastening layout with rain screen starter rain on a building envelope using structural sheathing. For vertical rainscreen wood siding designs, the new vertical siding starter rail makes design and installation of the Climate-Shield Rain Screen System easier than ever (shown below). 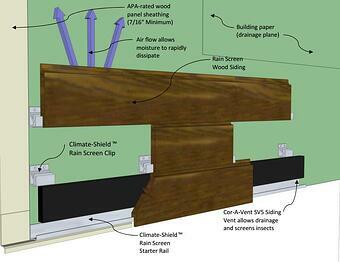 The Climate-Shield Rain Screen Outside Corner Base Component is installed prior to installing the wood siding to your rain screen design. After the wood siding installation is completed, the Climate-Shield Outside Corner Finish Component is attached to the Base Component using a rubber mallet. 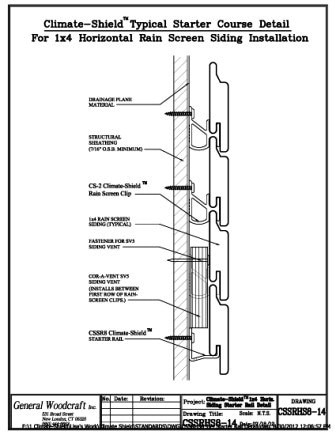 The Climate-Shield CSAC8 rugged 8' marine grade aluminum attachment channel is carefully constructed to provide a secure fastening attachment over non-structural exterior sheathings and masonry. It's unique design will simplify installation/reduce costs, extend a project's lifetime and ensure top performance when used with the following Climate-Shield Rain Screen wall systems. The Climate-Shield Attachment Channel for insulated sheathing over wood osdr steel studs is excellent for insulation up to 1" thick. 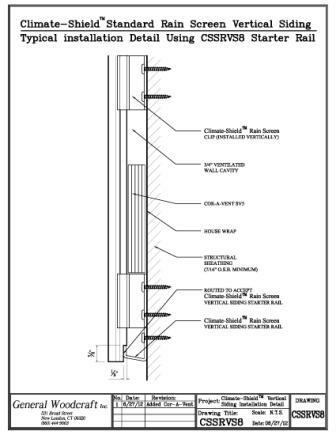 For thicker insulated wall assemblies, you may prefer to design with Z-girts. 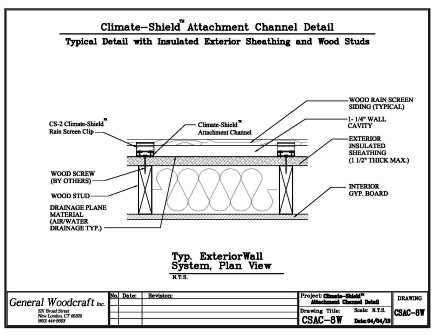 The Climate-Shield Attachment Channel works exceptionally well for exterior wall assemblies using exterior gypsum or cementitious non-structural panels over steel studs. 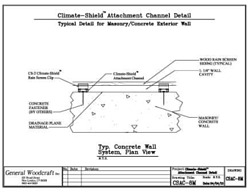 The Climate-Shield Attachment Channel works very well to create a solid attachment for the rain screen system over concrete or masonry wall assemblies. 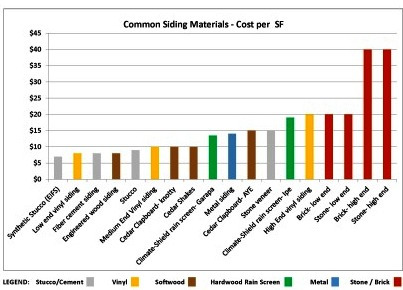 It is becoming increasingly more common for exterior insulation to be applied outside the traditional building envelope. This sustainable design practice is intended to help reduce the building or structure's energy consumption and makes sound environmental and economic sense. 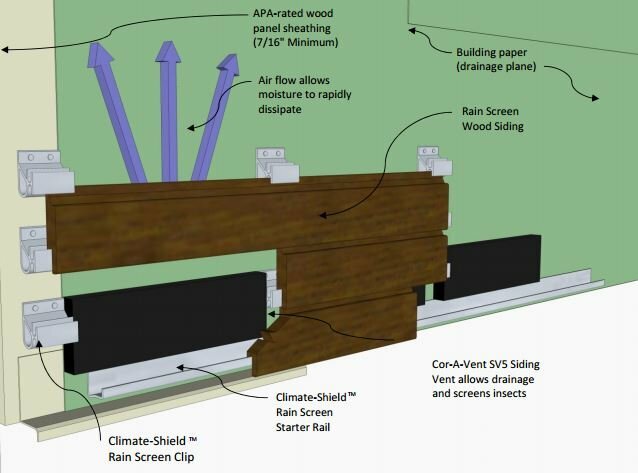 Climate-Shield has developed a Z-Girt to facilitate efficient installation of the rainscreen system in a design requiring exterior insulation. 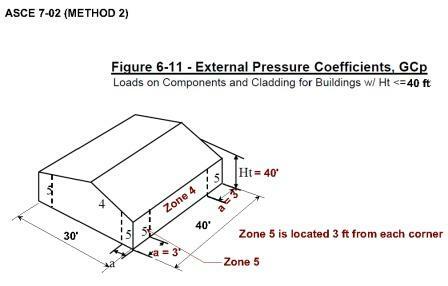 Whether your project is a commercial building design using metal framing and exterior gypsum, or wood frame construction using exterior insulation, the Climate-Shield Z-girts work extremely well to provide strong fastening points, ease of installation and design flexibilty for your rain screen system. 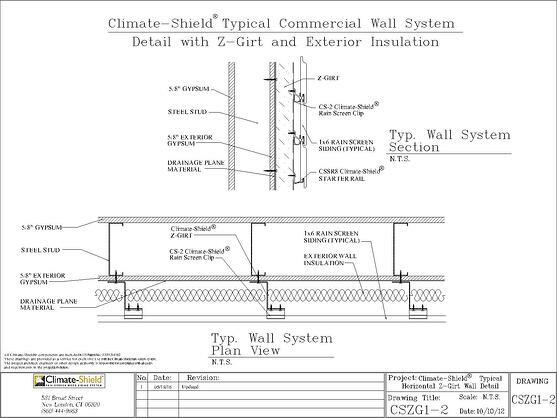 ABOVE: Photo illustrates a typical commercial building wall section using Climate-Shield Z-Girt, Rain Screen Cladding and Exterior Insulation. 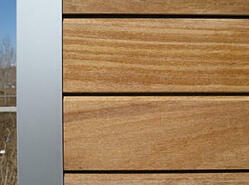 Additional rain screen wood siding species are available upon request. Contact us for more information. 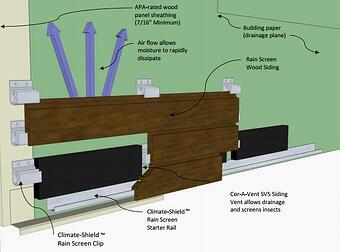 EcoHome Magazine recognizes Climate-Shield Rain Screen System as a top product innovation. Learn More about the Climate-Shield Rain Screen System which is engineered to withstand hurricane winds in excess of 200 MPH.